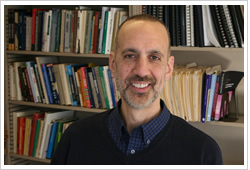 Gregory Ward (B.A., UC-Berkeley, 1978; Ph.D., University of Pennsylvania, 1985) is Professor of Linguistics at Northwestern University, where he has been since 1986 (and served as Department Chair from 1999-2004). He has also taught at the 1993, 1997, 2003, 2007, 2009, 2011 and 2013 LSA Linguistic Institutes. His primary research area is discourse/pragmatics, with specific interests in pragmatic theory, information structure, intonational meaning, and reference/anaphora. In 2004-05, he was a Fellow at the Center for Advanced Study in the Behavioral Sciences (Stanford, CA). His service to the LSA includes being Secretary-Treasurer (2004-2007) and a term on the Executive Committee (1997-1999).